A firm favourite show of mine, Phalanx is held at the Sutton Leisure Centre, St. Helens, Merseyside and is superbly organised by the Spartans (St. Helens Wargame Society). It can easily be taken for granted as to how much effort from everyone it takes to make a successful show, so before I start - thank you to all those that make this show possible each year. The venue offers a spacious sports hall, traders are there in good numbers and variety and there are plenty of games to inspire. It is surprising that considering the North West has two large cities (Liverpool and Manchester) in close proximity and North Wales and Cumbria on the doorstep, that the wargame circuit is really only represented in the region by this one show, making it all the more important to make sure that this show prospers (I say this against a backdrop of economic difficulty and a sense that we may be potentially seeing a movement towards fewer but bigger shows). Full show report follows, please press 'read more' for the rest of this post. 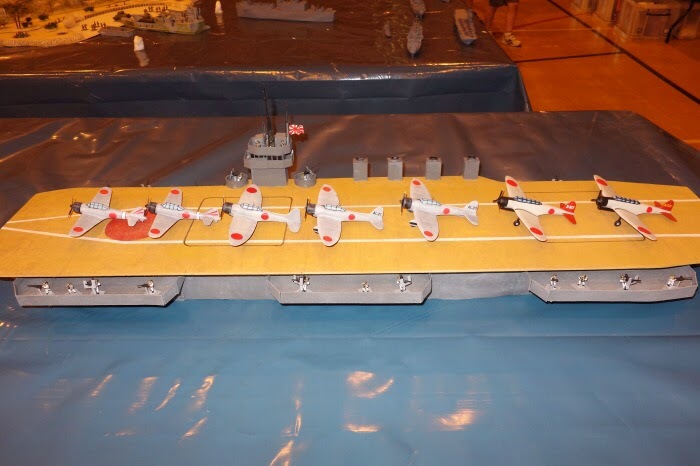 The lighting in the place is sodium based, which plays havoc with the camera white balance (giving a yellow hue) and even makes the colours of model paints being sold look slightly different than they really are. As someone who visits a range of shows across the country, often combining the visit with an overnight stay to make a bit of a break of it and to trick Mrs. Smith into thinking the weekend away is really for her, I am now increasingly mindful of perhaps just selecting a few shows that are important to me and making sure my money goes to them to help ensure their sustainability, rather than spreading the jam too thinly. Phalanx is a target show for me, so since March, I have skipped two other shows that I fancied, while waiting for this 'wargaming fix'. 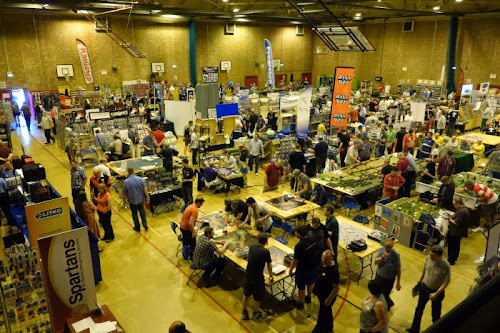 I have figured that the money saved in petrol etc can be diverted to give me a cash boost at this show and this year, I also put items on the Bring and Buy stall (for the first time in ages) and then took the proceeds back into the trader hall. So the end result of all that is that I have had a great day at a favourite show, with a bit of extra cash to spend there and hopefully everyone is happy. Anyway - on with the show. This year, the canteen was not available, so the organisers arranged for outside catering to take care of the refreshment side of things. This consisted of Susie's butty van which is a professional outfit. They did a great job, helped by the temporary tables and seats placed besides her van. It was a lovely sunny day, so that probably helped more than anything else. 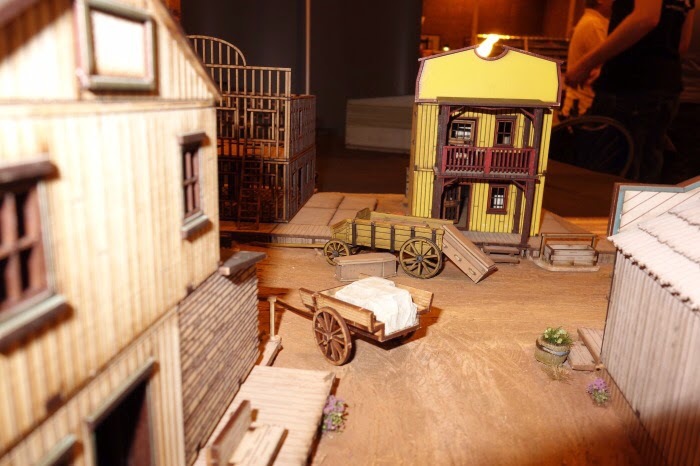 Also, the show clashed with the Durham show (North East), so a couple of traders were lost to that show. 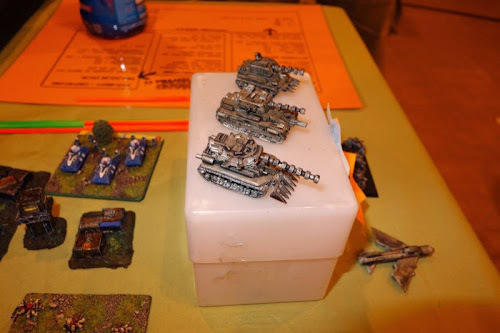 I know that Pendraken split their operation in two and supported both shows, which was good for me because my only pre-show order was with them and my first job was to collect the remaining 10mm WWII vehicles from them to flesh out the east front 1943 forces that I am using on the 'pinboard project'. The other main purchase I had planned was for two 10mm ACW armies. I am not ready for them yet, having just embarked on painting 1809 French / Austrian armies, but in the spirit of spending at Phalanx rather than somewhere else later in the year, I went against a self imposed discipline of not creating a 'lead mountain' and bought the armies from Kallistra (thank you Sally for getting that sorted for me). All these forces are intended for the 'pinboard' project, so standard army packs more or less give enough troops to give a pretty good core force and enough to get gaming in the period. 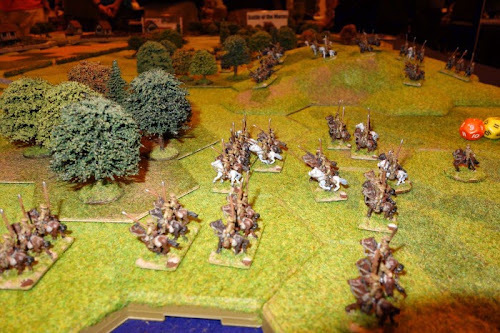 Other purchases included Vajello paints, flags, hex terrain and plenty of trees (in anticipation of those ACW battles). There was an excellent mix of books and rules, indeed the overall mix of product seemed better and more interesting this year - even on the bring and buy. I'm not sure whether that is imagination, because as said, some traders were missing. My present bugbear in general with shows is that there is no real deliberate attention given to providing customer seating in the trader hall. Instead, there is an over reliance on canteen facilities to give that function - which in several venues are upstairs. I say this from the perspective of someone with persistent back-ache, who just needs the odd 5 minutes every now and then, off their feet to re-charge and then be off again to see more traders. Anyway, this time around, I took my own solution, one of those portable open out backless chair things, that are super light, compact (doubles as a sort of walking stick) and not likely to annoy others (did someone say backpacks!). While not a seating style of choice, it was a great help at times, especially while queueing to take my stuff to the Bring and Buy stall. With a greying customer base, year on year there are going to be increasing numbers of customers needing a short seating break. Those shows that respond to this will benefit in the long run. I have mention Command Horizon before, as being the demo game that encouraged me to convert the pinboard over to 4" hexes. 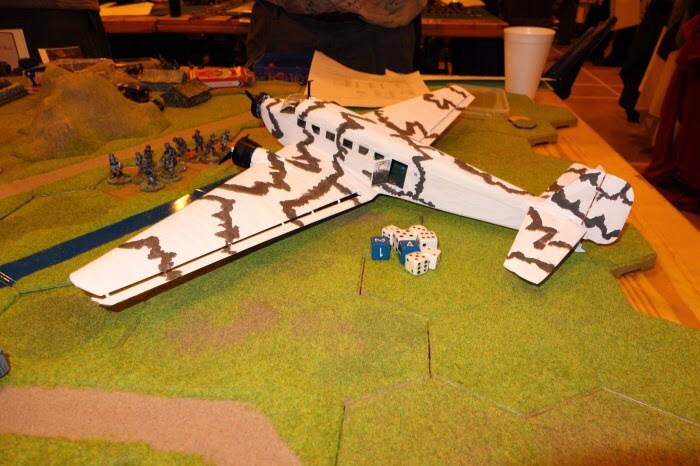 They were just using hexes to make their demo easier for the public to get involved with and their plan to return the system to an open board format has now come about. 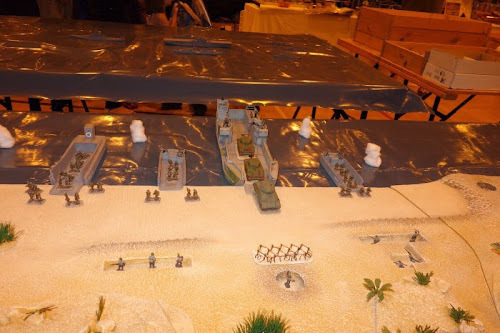 The Wargames Emporium have developed another alien race for their Command Horizon system and as can be seen below, it possible to get their game onto a small playing area, although most games will need slightly larger than this area. Still it looks great for the 'compact' minded wargamer though. A new alien race - the 'Remnant' have just had their vehicles produced (6mm) and the shot below just shows how nice and crisp the detail is on those (on top of the white box). Kallistra (producing hex terrain and 12mm figures) had a nice hex based WWI game going on in front of their stand based upon the Battle of the Marne 1914, the Chateau-Thierry. They have a draft version of their WWI rules available now (check their website). 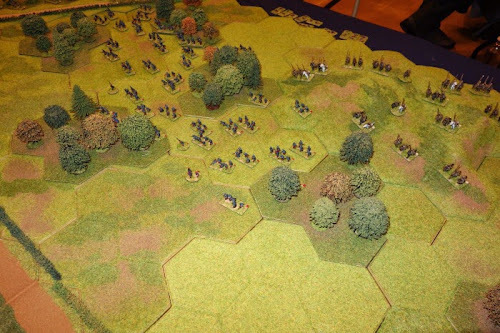 Below - The Fench infantry are advancing in the centre over open ground. 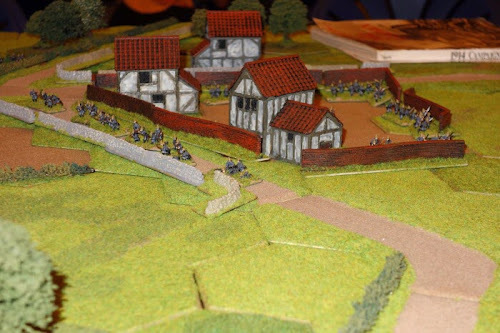 Below - A couple of British battalions proceed up the road on the right flank to thereaten the Chateau that lays directly ahead. German troops at the Chateaux take positions to repel the attack (Below). 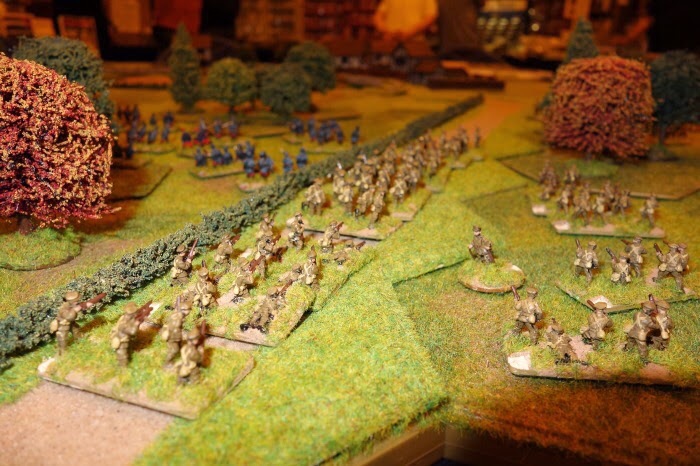 On the left, Allied cavalry move to threaten the German right flank (below). 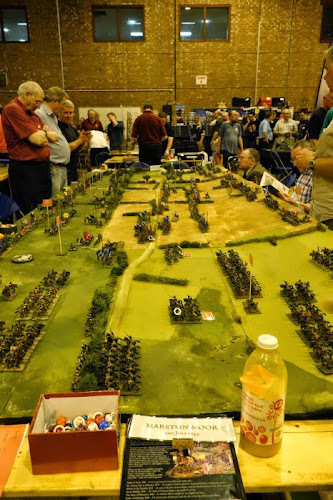 Dave Johnson of Wargame Retreat put on a spendid pacific battles game using a really large table. This was flanked on either side (on adjacent tables) by marvelous carrier models. Below - this is around 3 foot long. 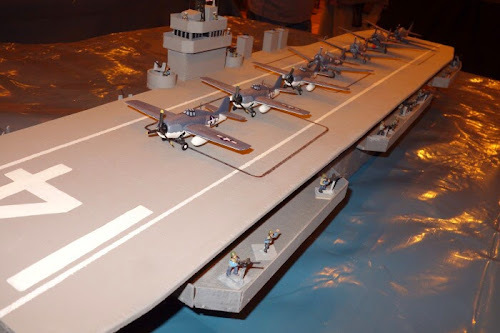 and this is the same carrier from another angle. This is an American carrier of likewise large proportions. The scenario is ficticious but based on typical fighting during the island hopping period. On this side of the island Buffalo vehicles land on the beaches Below. 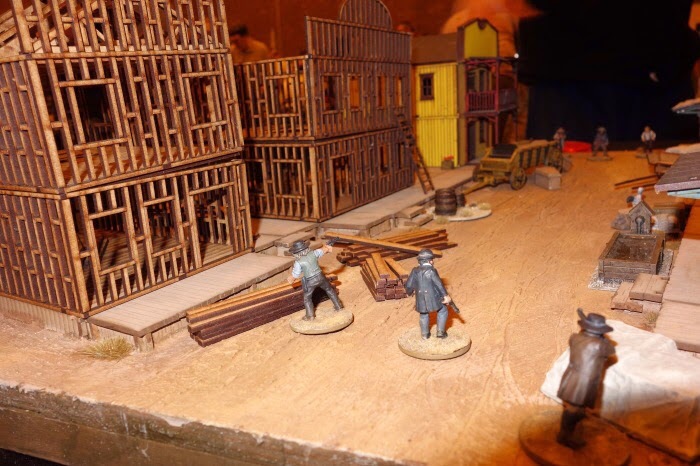 The display of a game like this is a huge undertaking for an individual to do - yet another person just helping to make the show a great experience. On the other side of the island, traditional landing craft do their thing and get troops onto the beaches. 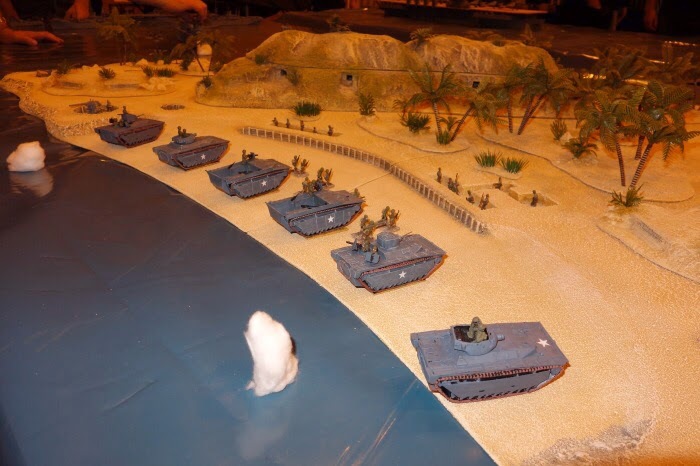 This is a defensive position that the troops in the Buffalo vehicles initially meet (Below). 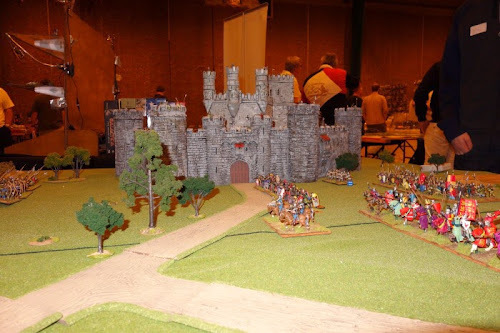 The Liverpool Wargames Association always do a nice stand with a mixture of figures and boardgames, with someone always there on the lookout to gather recruits to the club. Today they also put on a fairly compact game from the Barons Wars using Impetus rules. The castle is an imposing feature that makes a splendid backdrop. Plenty of colour on each side. They are apparently quite old 25mm figures, but I mistook them for 40mm, so perhaps scale creep has always been with us. I picked up a base and compared to 28mm plastic, the weight felt re-assuringly nostalgic (Below - the archers ready themselves). 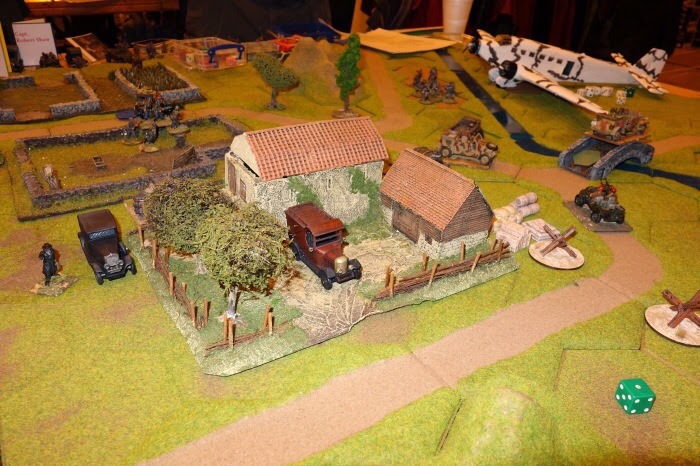 Bob Martin of Lancaster Wargames put on a fun game based around 'Where Eagles Dare'. Over the last few years he has done Dr. Who based games and his energy and enthusiasm really gets others involved, giving both dads and kids a great game. The first thing you notice is the eye catching aircraft. 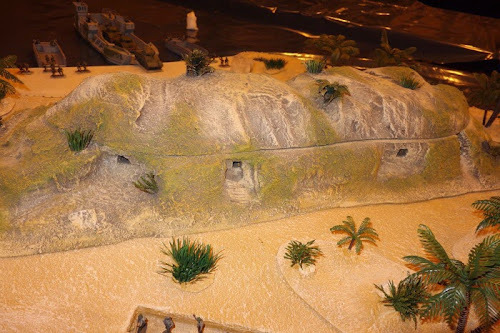 The game is in 28mm with Kallistra terrain and usually about 4 people were playing. The vintage vehicles just give a nice period feel (below). 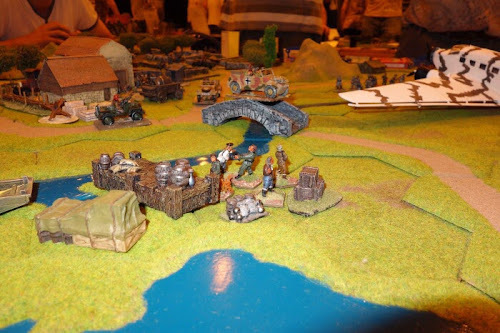 Competing with the pacific island table for being the largest at the show is the 28mm Marston Moor game by Mailed Fist of Godly Hyde. 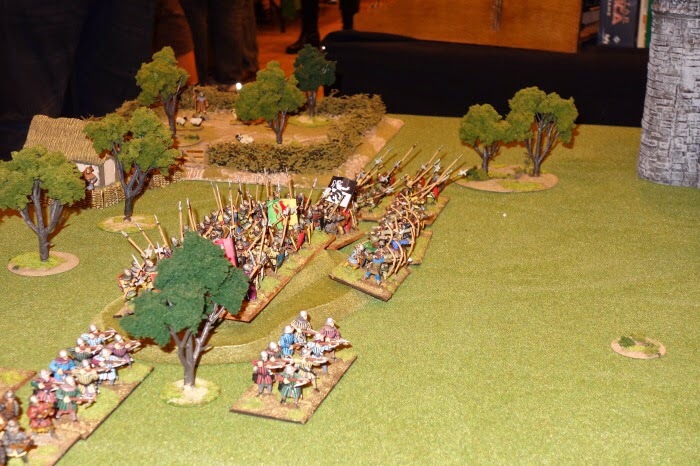 Everyone was having a great time and the ranks of pike, musket and cavalry provide a grand spectacle and a lot of work has gone into that terrain. It does feel like a real engagement unfolding (Below). 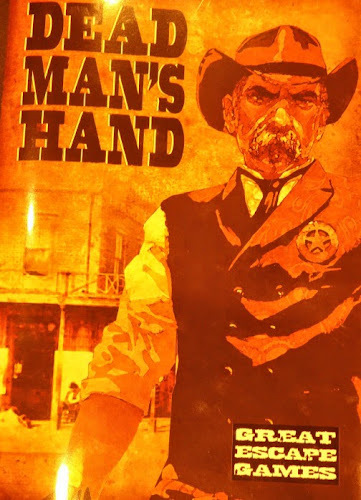 Great Escape Games had a lovely demo of their Dead Man's Hand game. If I had to choose a favourite set-up today based on looks, I think it would be this. The buildings are in MDF and the terrain board is just 2' x 2' yet this feels like it has plenty of room for the 28mm figures to have their shoot-out. There are so many nicely modelled touches on this board. The cart at the end of this street has a coffin partly loaded (and one already in the cart! must be a dangerous place). Bringing future spend forward, together with savings from recently non-attended shows, plus the sales at the Bring and Buy which went straight back into the trader hall, gave me a spending boost that left me feeling that I had done something positive towards the continued success of the show - not that I really consider this to be an issue of doubt for Phalanx, but perhaps we all need to start thinking about how we deliberately set out to support the gaming circuit and not take anything for granted. 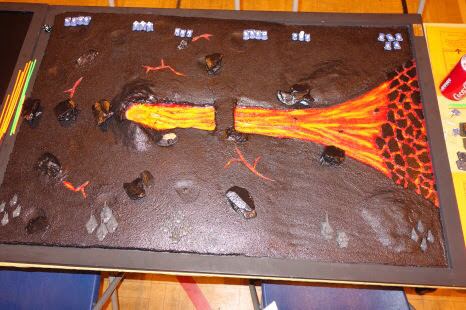 The Spartan wargame club did another superb job, making everything look easy and everyone looked like they were having a good day. 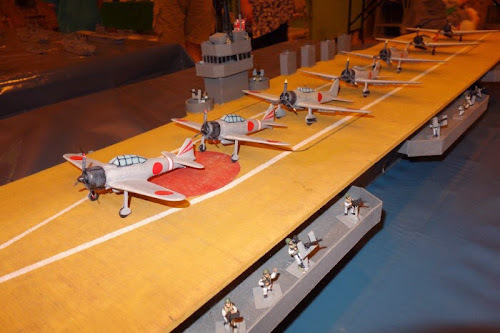 Hopefully with Father's Day tomorrow - kids had given their dads some extra spends for 'that bridge' or 'that book', they may not be sure why dad likes these toys ..... but at least they keep him quiet and it beats getting socks anyway. As a "local" I thoroughly endorse the importance of this North west event and hope all Merseyside and Lancashire gamers support it. Always an excellent show. Could I suggest if its possible the organisers consider the same outside caterer for 2015, better and faster than the on site facility ! !